With the Division I baseball playoffs collapsed into one bracket this year, Jesuit made a nice run. Winning three games, they made it to the semi-finals before falling short in the loser's bracket. The wins included a nice victory over #1 seeded Franklin. The school's baseball program has had only modest success over the last five years. The team missed the playoffs in 2014 and was one and done in 2015 and 2017. In 2016, the team made a nice run winning two games and losing two games. Jesuit last won a Sac-Joaquin D1-North baseball championship in 2011 and last won an overall D1 baseball championship in 2009. The 2017 CIF Sac-Joaquin Section Division I baseball north playoff bracket is here. 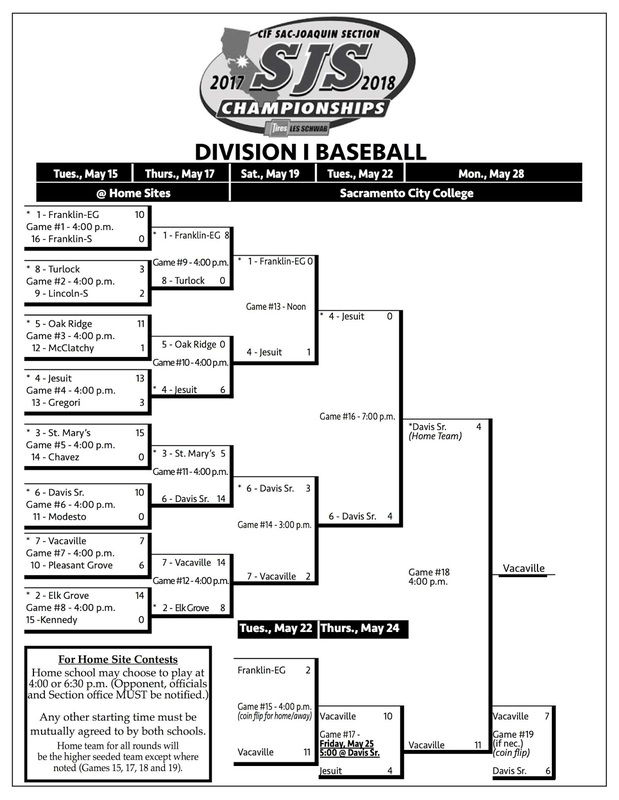 The 2016 CIF Sac-Joaquin Section Division I baseball north playoff bracket is here.